This beautiful property is nestled on a private lot with breathtaking views of the distant mountain valley and Conifer Mountain. The large, open great room boasts vaulted ceilings, wood floors, a cozy wood stove, and a full wall of southern facing windows which capture the amazing views. The updated kitchen adjoins the great room and enjoys granite counter tops, updated cabinetry, marble floors, a pot rack, a brand-new dishwasher and mostly stainless-steel appliances. The walk-out lower level has a large family room with gorgeous wood floors and a private master suite with en-suite bath. The spacious lot has a large fenced backyard, ready for your furry family members, a relaxing back deck and concrete pad plumbed and ready for a hot tub. The 3-car garage and extra off-street parking is an exciting bonus with this property allowing for multiple vehicles and hobby storage. 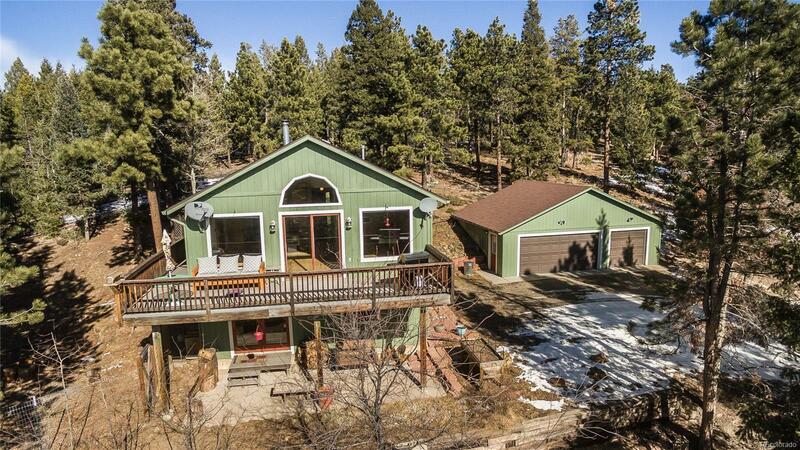 Located only 3.5 miles to Aspen Park amenities and Hwy 285, and 1.5 miles to Flying J Ranch Open Space Park.